Who Are the Top 40 Blue Jays of All-Time, Anyway? In honour of the Blue Jays’ 40th anniversary, Sportsnet put together a feature honouring the Top 40 Toronto Blue Jays of all-time (here’s their Top 20). While there’s some debate on the rankings, most of the Blue Jays who should be on that list are among the Top 40. But it begged the question – who are the Top 40 Blue Jays of all-time anyway? Or who are your Top 40 Blue Jays of all-time? I started compiling a list and trust me when I say it’s a much harder exercise than anticipated. For one, you don’t want to slight any players who have made significant impacts on this franchise. Secondly, you try not to go into this list with too much of a recency bias. If that were the case, Donaldson/Bautista/Encarnacion would go 1-2-3. Anyway, here’s my subjective ranking of the Top 40 Blue Jays of all-time ranked from 40 to 1. Aaron Hill’s tenure in Toronto may have ended abruptly in the summer of 2011, but he’ll go down as one of the franchise’s top five second baseman and the last legit cornerstone player the Blue Jays have employed. Earlier in his career with the Jays, Hill was revered for his defense, but it wasn’t until 2009 when his power numbers exploded to the tune of 36 home runs; the highest single season total of his career. I’ll admit, there’s probably a lot of recency bias going on here, but with two-plus years left of Russell Martin’s deal, I have a feeling he’s nowhere near finished contributing for the Blue Jays. A lot of what Martin does for the Blue Jays won’t show up on FanGraphs or Baseball Reference – his ability to handle a pitching staff, his defensive skills – but it’s difficult to imagine where the 2015 and 2016 Toronto Blue Jays might be without his contributions. Pitching in middle relief can be a thankless job; just ask Mark Eichhorn. He was one of the Blue Jays’ most dependable relievers for a six-year period, but because he consistently pitched in middle relief or as the setup man, Eichhorn’s name often gets forgotten. How about this? In 1987, Eichhorn made 89 appearances out of the bullpen. 89! The year prior, Eichhorn pitched so well and threw so many innings that he was five innings shy of qualifying for the ERA title. He had to settle with a minuscule 1.72 ERA that season and it remains the second best single season ERA by a Blue Jays reliever. Along with Carlos Delgado, you may as well just lump these four players together as a package deal. The combination of Shannon Stewart, Jose Cruz Jr., Shawn Green, Carlos Delgado (and to a certain extent, Alex Gonzalez) drove the bus for the Blue Jays in the late 90’s/early 2000’s. Green in particular was the standout candidate of this trio of homegrown Blue Jays players. A legitimate 30/30 threat, Green was just hitting his peak as he was on his way out of Toronto (of course). He may have only been in Toronto for two seasons, but the numbers Clemens put up (whether or not they were aided by performance enhancing drugs) were ungodly. Statistically speaking, Clemens’ 1997 and 1998 seasons are still the best ever by a Blue Jays pitcher. Clemens was one of the main reasons why the 1998 Toronto Blue Jays stood a chance to even get a sniff at the playoffs, if it weren’t for the 114-win New York Yankees and the 92-win Boston Red Sox. For me personally, Alex Rios was my favourite Blue Jays player when I got back into baseball after 2005. He was a five-tool player who had it all, and was on the precipice of becoming a perennial All-Star. Somewhere along the way, the organization soured on Rios; the Blue Jays traded him to the White Sox one year after they signed him to six-year contract extension. Nevertheless, Rios was an entertaining figure during his time in Toronto. Of all the players on this list, Fred McGriff is the one Blue Jay who might be the most underrated of all-time. Most will probably recall him as part of the package that brought in Joe Carter and Roberto Alomar, but McGriff was the perennial contributor at first base. Had McGriff not come seven home runs short of 500 for his career, he would be a shoo-in for the Baseball Hall of Fame. In 1992, was there a deadlier duo in the back end of the bullpen in baseball than Duane Ward and Tom Henke? Ward toyed in middle relief roles for several years, but it wasn’t until the early 90’s that Ward settled into the setup role with the Blue Jays. Then in 1993, Ward had the best season ever by a Blue Jays reliever. It wasn’t uncommon for him to throw north of 100 innings in a season and collect 70-8o appearances, which is practically unheard of in today’s era of bullpen micromanagement. Ward was never the same after that banner season in 1993 as his career came to a crashing halt after a debilitating shoulder injury. Devon White is another one of these cases where it felt like he was a career Blue Jay, but in actuality, he only played five years in Toronto. It just so happens that Devo enjoyed his best seasons in a Blue Jays uniform. In many ways, White reminds me a lot of Roberto Alomar in that they could affect the game on so many levels. White was a legitimate threat to steal, he was the quintessential leadoff hitter and he had the propensity to steal home runs with incredible catches like these. White is the best defensive outfielder the Blue Jays have ever had; he made today’s five-star catches look effortless. White didn’t chase down fly balls in centre field, he glided to them. So not only did White steal runs, he gave back in droves on offense with his bat and his speed. When thinking of the best Blue Jays of all-time, placing Joe Carter among the pantheon of Blue Jays legends is a bit of an agonizing task. Here he has the most iconic moment of the franchise. On the other hand, he was an RBI machine and not exactly an analytics darling. Carter fits the prototypical cleanup hitter profile from the early-to-mid 90’s, but considering the incredibly talented hitters that hit in front and behind him, maybe that’s not a bad thing. Carter had his iconic moments as Blue Jay, but he ultimately did what he was brought in to do; hit home runs and drive in runs in the process. It’s hard to fault Carter for his consistent contributions in a Blue Jays uniform. Is there any player on this list whose story is more improbable than Jose Bautista’s? A guy who was brought in on a whim during the 2008 season blossomed into one of baseball’s biggest power hitters of the last decade. For several years, Bautista was one of the few reasons to watch the Blue Jays play from 2010 to 2014. Then, Bautista finally received some reinforcements leading into the 2015 season, and he made his mark on the Blue Jays franchise with his seminal moment: the bat flip. Bautista’s breakout 2010 campaign with 54 home runs was incredible to watch, but his follow-up in 2011 was even more impressive where he drew 132 walks and OPS’d 1.056. 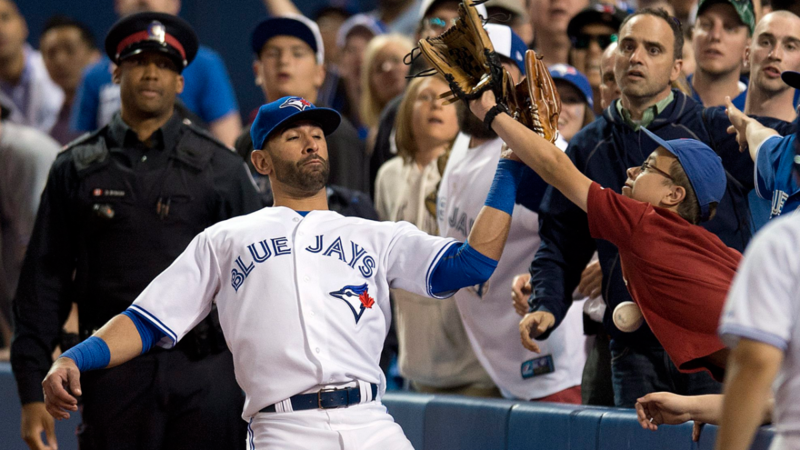 Regardless of how the Bautista era ends in Toronto, he’s a surefire Level of Excellence and a Top 10 Toronto Blue Jay. I may have only been a young lad when Dave Stieb was mowed down the competition in the 80’s and early 90’s, but I was old enough to fully grasp and appreciate what Roy Halladay accomplished as a member of the Toronto Blue Jays. Halladay starts were always appointment viewing because he had the tendency to shut down opposing hitters, no matter how formidable the lineup. Doc was that good. And for a few years during his time with the Philadelphia Phillies, the rest of baseball had their eyes opened up to Halladay’s talent level. In terms of franchise-best pitchers, Halladay may be the bridesmaid to the bride, but there’s no discounting how utterly dominant Doc was from 2002-2009 with the Blue Jays. Was there any Blue Jay who had more sheer power than Carlos Delgado? When I think of his name, I instantly imagine Delgado clocking a baseball 400 feet above windows restaurant and chucking the bat like a toothpick. Delgado’s claim to fame was his sensational four home run game, but year after year, he put up tremendous numbers for what was otherwise a forgettable Toronto Blue Jays baseball team. Delgado owns practically every franchise record when it comes to power numbers. Delgado’s 336 home runs as a Blue Jay will be tough to beat and that’s likely a franchise record that stands for a very, very long time. If only Delgado had the supporting cast, he may have played in that elusive postseason game as a Blue Jay. Technically, Roberto Alomar is the greatest Blue Jay ever because he’s the only Blue Jays player in the Hall of Fame. However, I’ll say this – Alomar was the best position player to play for the Blue Jays ever, and it isn’t even close. Alomar was a threat in every aspect of the game; at the plate, on the base paths and on the field. It’s funny, because during the Blue Jays glory days of the early 90’s, Alomar was viewed more as a secondary character to guys like Carter, Molitor and Dave Winfield. But in essence, Alomar drove that Blue Jays offense. Were it not for Alomar’s home run against Dennis Eckersley in Game Four of the 1992 ALCS, the Blue Jays might still be called the “blow Jays”. Leading up to that game, the Jays had the reputation as chokers in the playoffs or down the stretch (think back to the collapse of 1989). Alomar changed all that with one swing of the bat. The only knock against Alomar here is that he “only” played in Toronto for five years. Statistically speaking, Alomar’s best years came in Cleveland, but he also put up some big numbers in Baltimore. You could actually make a case that Alomar was one of the best Blue Jays of all-time and one of the best Cleveland Indians of all-time. With all due respect to Mr. Alomar, when I think of the quintessential Blue Jay, I think of Dave Stieb. Save for that super short period as a member of the White Sox, Stieb spent his entire 16-year career as a member of the Toronto Blue Jays. Along the way, he carved up American League hitters like nobody else. He may not have been the most affable personality, but Stieb was all-business on the field. It wasn’t uncommon to see him screaming obscenities after giving up a hit, let alone a home run. Some of Stieb’s stats are eye popping – like 19 complete games in 1982, or his 2.43 ERA in 1985. Stieb’s fatal flaw is similar to that of Halladay; he played for some brutal Blue Jays teams early on. Back then, voters weighted the win-loss record very heavily, and Stieb’s record was often no indication whatsoever of how good of a pitcher he truly was. Stieb is one of these rare cases in which was one of the best pitchers of his era, but as the years progress, just like a fine wine, his numbers look better with age. Whether it was back then or now, to me, Dave Stieb is the best Blue Jay of all-time.